The British are coming to help the town celebrate its 375th anniversary during Family Fun Fest on July 5. The Independence Day holiday -- with an extra nod to Fairfield's 375th anniversary -- will get a star-spangled salute Saturday and Sunday. And with fine weather in the forecast for both days, the annual July 4 fireworks -- rescheduled from Friday because of rainy weather -- promise a spectacular sky show at dusk Saturday over the town's beaches to cap off the day. 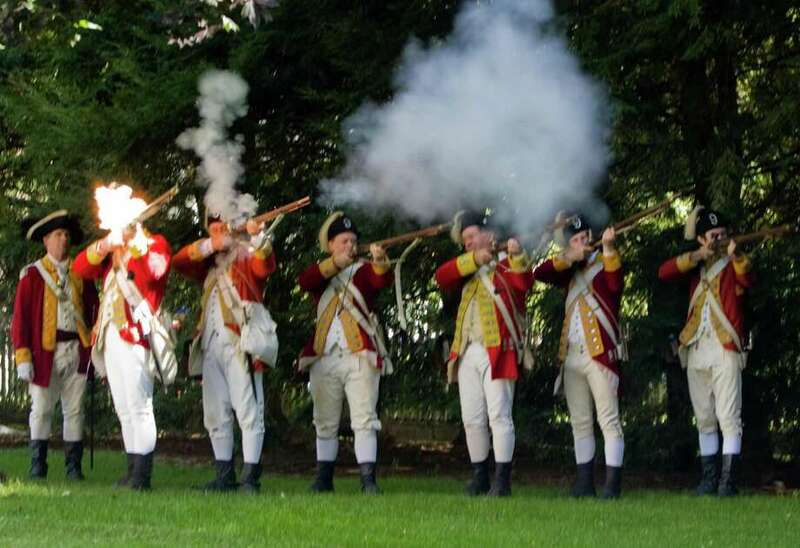 Earlier Saturday, the Fairfield Family Fun Fest will take over Town Hall Green, and a major feature of the event will be an "invasion" by soldiers from the British army portrayed by a group of historical reenactors. The free festival, from 10 a.m. to 4 p.m., also will include attractions like food trucks and a beer garden, musical performances, artisans, children's games and a pop-up market. The re-enactors, wearing the uniform of British forces, will set up an encampment on the Fairfield Museum and History Center's commons, next to the green, complete with a musician and camp followers. During the course of the day, there will demonstrations of camp life, close-order drills and discharging weapons. Headlining the musical entertainment will be reggae musician Mystic Bowie. Other acts include the Mill River Band, Girls on Bikes and John Reid. The fun fest is being organized by the museum, the town, Chamber of Commerce and the Fairfield Theatre Company. The museum will be open free of charge during the event, which will take place rain or shine -- although sunny, warm skies are in the forecast. The Old Academy on Town Hall Green also will also be open by the Daughters of the American Revolution as a complement to the Fun Fest activities. There will be limited on-site parking for the Family Fun Fest, but free parking will be available nearby at Sherman School and First Church Congregational. On Sunday, museum will offer its annual "Burning of Fairfield" walking tours, exploring the history and events surrounding the attack on Fairfield by the British on July 7, 1779. First-person accounts of the attack -- which decimated local properties set ablaze by the invaders -- will be read by costumed interpreters. The Burning of Fairfield tours will take place from noon to 3 p.m. Registration is required. The cost is $10 for adults and $5 for students. For more information on Family Fun Fest's participating vendors, restaurants, music and activities, visit www.fairfieldct.org/FunFest. To register for a walking tour, call 203-259-1598 or visit www.fairfieldhistory.org.